In the late middle ages, Dominican and Franciscan monks developed the skill of preaching to a high degree. They were responding to the spiritual needs of a growing lay population--country people and city-dwellers, literate and illiterate--who needed more direct contact with the church. Nicholas of Gorran, a 13th-century Dominican based in Paris, was one of the greatest experts on delivering the meaning of the bible to the laity. He wrote the commentaries on the gospels, catholic epistles and revelations copied in this manuscript, which would have been used by other preachers to compose sermons in English. It belonged, according to inscriptions in it, to the collegiate church and hospital of St Thomas of Acon (or Acre) in Cheapside, London. Founded about 1190 in memory of Thomas Becket by his sister, Agnes, the hospital was bought after the Reformation by the Mercers' Company, who built their Hall and Chapel on the site. 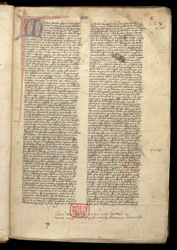 This page begins the prologue of Nicholas of Gorran's commentary on the Gospel of Matthew. It is clearly a working book: the writing is densely packed, with minimal decoration. Its users left study notes in its margins. In the lower margin, the inscription says that William Pyknam, archdeacon of Norwich (1472-1497) gave the book to the Hospital of St Thomas of Acon in London.